The Indianapolis Colts aren’t fancy. They aren’t going to have the big, Sportscenter highlights on a regular basis. But they win football games. They have solid players. They have great leadership at the head coach position in Chuck Pagano. 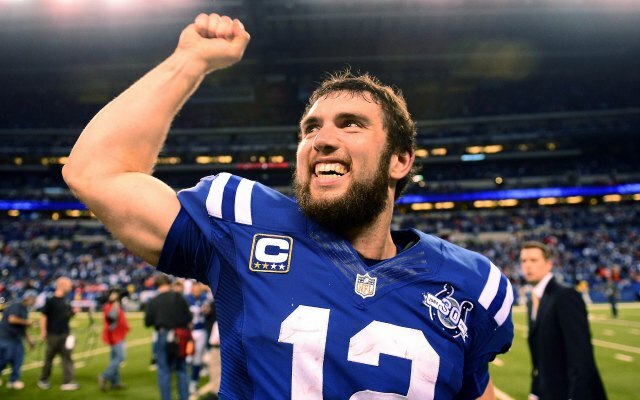 They have the future of the NFL at quarterback in Andrew Luck. Those reasons alone show that the Indianpolis Colts will be back in position to make a strong playoff run in 2014 & win the AFC South, holding off the Houston Texans. Andrew Luck is showing that he is truly the future of the NFL, as his legend grows more & more, especially after the 35-3 comeback against the Kansas City Chiefs last year in the AFC divisional playoffs. Luck has been able to perform without Reggie Wayne, who tore his ACL earlier in the season against the Denver Broncos, & without the real contribution of running back Trent Richardson, whom the team traded for during the season from the Cleveland Browns. On the defensive side of the ball, Robert Mathis had a strong season, leading the league & team in sacks, the secondary was average & the rest of the team was pretty average. Indianapolis Colts quarterback Andrew Luck has the talent & the winning ability to take an average Indianapolis Colts team deep into the playoffs & possibly the Superbowl. The Colts are another team that we will not do a breakdown of offense & defense persay because the team has a mode & formula for victory…….stay in the game until the 4th quarter when Andrew Luck is going to take over. Luck is becoming one of those quarterbacks who don’t need to put up major numbers, doesn’t even need hall-of-fame level receivers, but he makes the players around him much better, similar to what Peyton Manning did in Indianapolis for many years. Flat out, if Andrew Luck is healthy for an entire season & his receiving core stays somewhat in tact, the Colts will go 12-4 & host a playoff game again. The Colts are at the level where they are measured by what they do in the playoffs, not the regular season. The team is looking for a Superbowl this coming season & are in position to do so. Andrew Luck has won in life on & off the field, with his hot girlfriend, Nicole Pechenec. a gymnast who went to Stanford with Luck. The area that will hurt then is losing Mathis for the first 4 games of the NFL season because of taking a banned substance while he & his wife were trying to have a child. If the Colts go 2-2 or 3-1 during that stretch, the team will be in a great position to win the division, especially if its close in the 4th quarter, which most of their games will be. Prediction – 12-4 – playoffs, all the stats & stuff just aren’t going to matter.